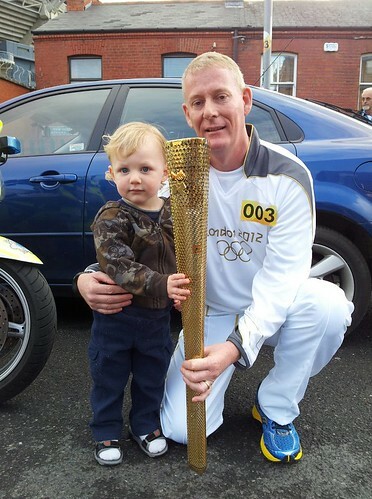 Henry stands with Olympic Torch bearer Brian Brunton, helping him carry the load. hmmm. Are you certain it shouldn't be "Jedward were"? are Jedward, whose real names are John and Edward. They're Irish twins who did well on some talent show thing over here and have parlayed it into international teenybop fame. That is an excellent picture! I really miss having a "like" button, damn it. sometimes I just don't have anything particularly useful or intelligent to say, but having that silly button means I can let people know that I am paying attention and that I think whatever thing has been posted is cool (nifty, neat, awesome, worthwhile, stellar, fantastic... fill-in-the-blank with your own favorite adjective). so if I start commenting on your posts with a *like* and nothing else... you'll know why. I am horrified by the Jedward photo though. Didn't we leave that hair in the 80's? Many people are horrified by Jedward's hair. One brave man decided to do something about it. I remember when I got to see the torch back in 96. It was spectacular. That is a fabulous picture! And, as you must know, he looks utterly adorable! I am inestimably envious of both of you.